ThermoLink™ Heat Exchanger – The primary cause of premature heat pump demise is the failure of the heat exchanger. Ordinary heat exchangers are made from a cupronickel alloy. This cupronickel material is susceptible to attack from the sanitizers used in pools and spas, and from other related water chemistry conditions. Once the heat exchanger fails, the heat pump is ruined. The ThermoLink™ Heat Exchanger tube is made from pure titanium, and is virtually impervious to water-chemistry damage. ThermoLink also features a patented water management system that maximizes surface contact of pool water, providing superior performance than competitors. Allow us to introduce you to HeatWave SuperQuiet, our TOP selling and most sought after model. 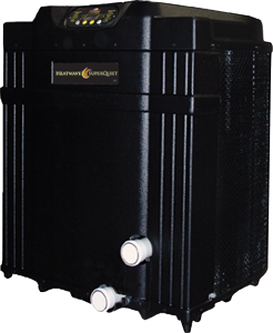 Pure Titanium Heat Exchanger at its core – the HeatWave SuperQuiet Series offers you optimum return on your money. At 55 dB, AquaCal’s HeatWave SuperQuiet heat pumps are virtually silent from 10ft. away! HeatWave SuperQuiet Heat Pumps are fully tested and certified by AHRI. Comes standard with a limited lifetime warranty that keeps you stress-free for the life of the heat pump. HeatWave SuperQuiet SQ Series is a sure-fit for your swimming pool. Designed for residential and commercial pools with large surface areas. Works great for smaller pools where over sizing is desired. Comes standard with a limited lifetime warranty that keeps you stress-free for the life of the heat pump. SuperQuiet SQ166R is a sure-fit for your swimming pool. Designed for residential and commercial pools with large surface areas. Works great for smaller pools where over sizing is desired.